Experience the captivating, fiery dynamism of flamenco! Abrepaso Flamenco and nationally acclaimed choreographer/dancer Alice Blumenfeld bring the passion of flamenco to Cleveland Saturday May 18th at Kennedy’s Theatre in Playhouse Square. 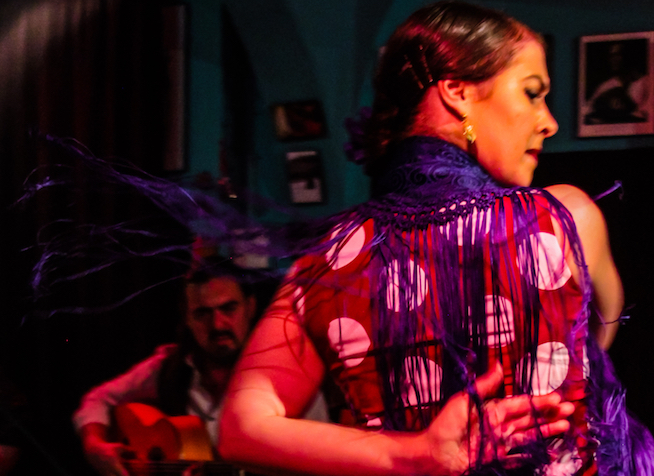 A tablao is the most intimate and traditional place to experience the intensity and fiery emotions of flamenco, perfectly recreated in Kennedy’s cellar theatre, a venue reminiscent of rustic Spanish bodegas. Abrepaso will be presenting a series of flamenco tablaos over the next year in Cleveland and NE Ohio. The entire series journeys through the romantic and spellbinding countryside of southern Spain with the music and dance of nationally and internationally acclaimed flamenco artists. Tablao Flamenco: Del Campo features Marija Temo (originally from Akron, OH) on guitar and vocals, Moisés López Ruiz (Sevilla, Spain) on flute, Alice Blumenfeld on dance, and Liam Smith (Oberlin) on percussion. The name Del Campo (of the fields) refers to the flamenco styles based on folk songs of Andalucía, and the performance will feature these styles.